100% deposit is required and non-refundable deposit. 100% charge of the booking for no show. Family is accepted as the group booking. 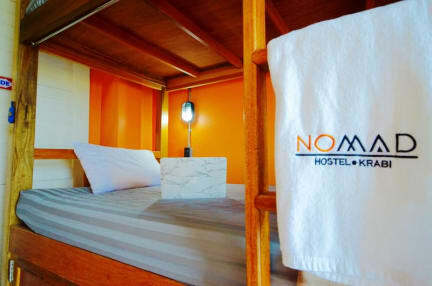 Nomad Hostel Krabi is a modern, cozy, boutique hostel for backpackers and flash packers of all ages looking for a quality place to stay. Did we mention we have probably the most comfy dorm beds you've ever slept in? Seriously! We are not a party hostel but we are a small, family run hostel perfect for a little rest and relaxation, or a great place to explore the authentic, less touristed charms of Krabi Town. We do our best to support the sustainable and responsible travel. Nomad Hostel Krabi is a family owned and operated hostel and we always do our best to give you a relaxed and comfortable stay. 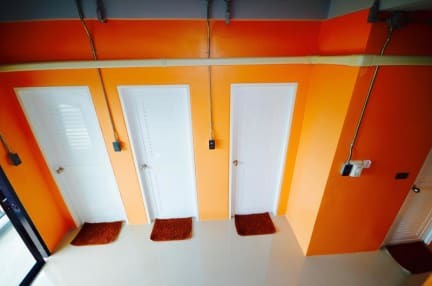 The hostel is decorated in earth tone colours to provide a calm and cozy atmosphere throughout and our big, chilled common area is perfect for meeting new friends or relaxing with old ones. We are not a party hostel but cold beers and other drinks are available along with board games, TV and a plant filled outdoor area. Free self service coffee and water is available all day along with basic kitchen facilities such as microwave, refrigerator space, kettle and cutlery etc. In this digital nomadic world there is also free wifi throughout the building. We understand that our nomads are searching for a comfy, safe and clean bed at an affordable price. Our range of small or larger dorms all include air-conditioning AND fans, plus windows and terraces. We provide a very high quality of mattresses, pillows, towels, blankets and bed linens on our super sturdy wooden bunks. All beds feature reading light, shelf, universal power outlet and private over-size, under bed lockers free for use - just bring your own padlock. All beds also have curtains installed for your privacy and comfort. All dorms have attached ensuite shared shower rooms with unlimited hot water and toilets. Dorms and bathrooms are kept meticulously clean. Nomad Hostel Krabi encourage sustainable, eco-friendly travel so water refill services are provided and re-usable straws are available for use or purchase to help reduce plastic use. We don't support animal cruelty tours or shows but our tour desk can help organise all manner of tickets, tours, bicycles or moto rentals to help you enjoy your Krabi Town experience as much as possible. I didn’t end up staying here because my plans changed but I’m giving them a perfect 10 because they were so accommodating and easy to communicate with. I ended up leaving Koh Tao later than expected and wasn’t going to arrive in Krabi until early in the morning- they said I could still stop by to rest and do a late checkout before my flight. I ended up going straight to the airport and they didn’t charge me for the night. Exceptional customer service, stay with them when you’re in Krabi! Fantastic hostel. Stayed there before my 10 am flight. Luggage security under bed. Bathroom clean and beautiful. Beds have little curtains, lights, and outlets. No complaints! The people working there were so nice. Quick walk to all the night markets and Krabi Town. By fair the cleanest hostel I stayed at in the month of traveling Thailand.The Mexican food down the street was better than some in California a present surprise.staff was friendly and very helpful would definitely recamond if you are in Krabi and need a place to stay! Loved my stay here. Comfortable bed and a nice towel. The staff was very friendly and helpful, I got useful information about getting around Krabi and the staff helped me book transportation to the tiger cave temple and to the airport. I wouldn't say the hostel is particularly social, as I was in a 6 bed room and was often the only person there. It's a 20-minute walk to the night market and river, and about a 25-minute ride to Aonang Beach, but a white truck picks up regularly right outside. Staff were lovely, not very much English when I was there (apparently the daughter is better at English?) But massive smiles and really helpful all the same!! So so clean perfect for my one night stay after my flight, they booked my transfer to koh lanta the next day for me too. It was really quiet when we stayed and due to lack of social space I think it wouldn't be the best place to meet people. Price was great would stay again! Great quiet hostel in Krabi Town. Not really any atmosphere to speak of but the beds are comfy, the bathrooms are nice, and the family that runs it is super helpful when they can be (mom and dad don’t speak English but their daughter does.) Loved the curtains on the beds and the free water. They also have deals worked out with tour companies and minivans if you need any of that stuff booked. I extended my stay twice because the family who runs this hostel are one of the nicest, most awesome people I have met. Here's the PROS: - super clean - great service - comfortable bed - hotel like bathroom Here's the CONS: - No atmosphere - a little far from stuff I would stay here again because it's a great place to go to just get some quality rest and live like a local because it's not super close to the touristy areas.